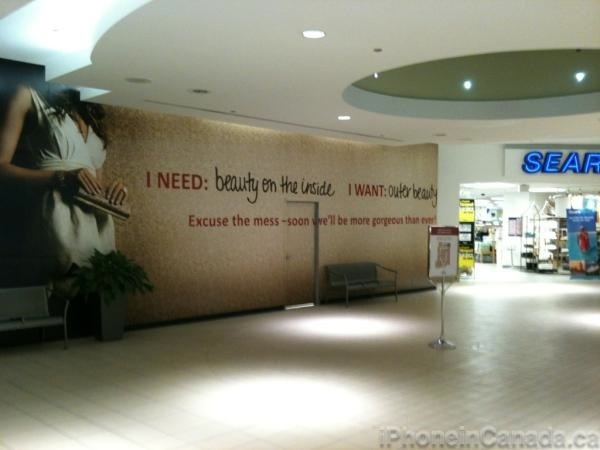 Rumours swirled about Apple coming to the Maritimes in January, and later in March we exclusively confirmed Halifax was set to receive an Apple Store as we detailed the store layout and its floorplans within the Halifax Shopping Centre. We also noted the new Apple retail location started to accept job applications back in early April. Below is an updated image of the store front, which has received its painted white Apple logo on the black panels, a sure sign an opening is coming soon. The store has reportedly received furniture and numerous fixtures, according to @ifoAppleStore. With Apple set to debut the next iPhone at a September 12th media event, the opening of the Halifax Apple Store surely will take place within the next month or so. For those in the Halifax area, be sure to keep us updated if you see anything new. Be sure to email us or tweet us! The most recent Apple Store opening in Canada was at Masonville Place in London back in June.